The Global Poetry Anthology 2015 is a one-of-a-kind collection of contemporary poems, previously unpublished, gathered from all corners of the English-speaking world. The international editorial board ensures the present volume's cosmopolitan palette and the blind selection process guarantees that selections have been made according to poetic caliber alone. Véhicule Press's Signal Editions is proud to offer the third volume in the Global Poetry Anthology series—a rich and exciting mix of established and emerging voices. 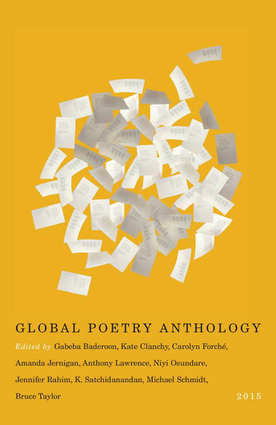 The Editors of the Global Poetry Anthology include Gabeba Baderoon, Kate Clanchy, Caroyln Forche, Amanda Jernigan, Anthony Lawrence, Niyi Osundare, Jennifer Rahim, K. Satchidanandan, Michael Schmidt, and Bruce Taylor.